Understanding and documenting historical agricultural land use and farming practices is important for assessment of environmental benefits of no-till (NT). To address the need for quantitative estimates of time patterns of tillage practices, this study proposes modeling the time patterns using the Markov chains framework and estimating the probabilities of transition from one tillage-crop combination to another tillage-crop combination from time-ordered spatially aggregated data. 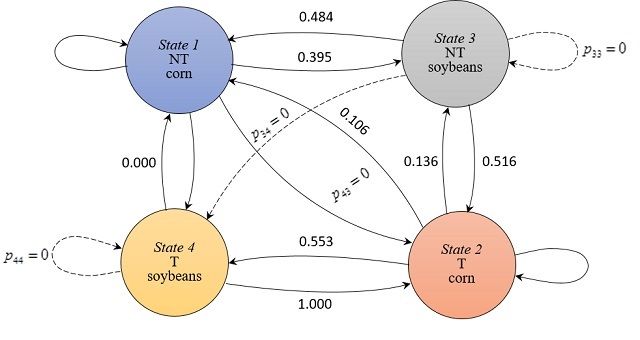 We developed a first-order, four-state Markov chain model of tillage-crop dynamics in corn (Zea mays L.)–soybean (Glycine max L.) production systems and estimated the transition probabilities for the state of Iowa using the 1992 to 1997 data collected by the Conservation Technology Information Center. The transition probabilities strongly suggest that the majority of NT acreage is not in continuous but rather in rotational NT, i.e., NT crop production in rotation with conventional or other tillage systems. We find that the probability of two-year continuous NT is 8%, and that 70% of Iowa cropland has never used NT over two consecutive years. When three-year tillage history is considered on corn acreage, 3% is in continuous NT, 62% has never used NT, and the rest of the acreage is in rotational NT. When three-year tillage history is considered on soybean acreage, 4% is in continuous NT, 56% has never used NT, and the rest of the acreage is in rotational NT. The methodology presented is applicable to corn–soybean production systems in other regions and is generalizable to other cropping systems. Regional estimates of the use of rotational and continuous NT are likely to benefit simulation modeling for the assessment of the environmental effects of alternative tillage practices. Kurkalova, Lyubov A. and Tran, Dat Quoc, "Is the use of no-till continuous or rotational? Quantifying tillage dynamics from timeordered spatially aggregated data" (2017). Modelling the Dynamics of Tillage Choices. 1.